Whether you’re looking for a sailing job aboard one of our boats or a position shoreside, working at Sightsailing may be one of the coolest seasonal jobs you’ll ever have. With spectacular sailing grounds and a legendary history, Newport is considered by many to be the sailing capital of the world. You will not find a better place to sail, or a town with more like-minded people, passionate about what they do. We invite you to consider the challenge of working in an outdoor environment as part of a team. Our positions require professionalism and commitment, yet offer fun and recreation, friendships that often last a lifetime, personal achievements, life skills and valuable work experience. Our success has been the direct result of the great individuals who work here. We employ enthusiastic, organized and positive individuals who represent Sightsailing and themselves well. A great attitude, good work ethic and friendly personality are a must when working with the public and other employees. We look for people who are reliable, can make work a priority and commit for the season. Whatever your position and responsibilities, your punctuality and attendance is essential to our operation. We’re open 7 days a week from early May until late October. Our dockside office is open 7 days a week from May through October. Front Desk staff work a variety of opening, mid-day swing and closing shifts. You should be a flexible in your availability, a team player and able to work weekends as well as holidays. We hire front desk staff that can commit to the entire season (May-October) and occasionally students returning to school in the fall. If you’re a student, you need to be able to commit to work through Labor Day and ideally still work 1-2 shifts per week through the middle of October. Unfortunately, because we are a seasonal, busy business, we cannot give you 2 weeks off in the middle of the season! AQUIDNECK CAPTAINS: Aquidneck, our 80′ schooner, sails with one licensed captain and two crew, seven days a week (weather permitting) from May until the end of October. Ideally, Aquidneck captains and crew should be available to sail from May through the end of the season in late October so everyone trains and gets started together. Additional work for handy people who like getting their hands dirty is available in the yard beginning in mid March or April, as well as post-season into November. We typically hire two captains who rotate between a 4/3 day per week schedule. Additional work on our smaller boats is often available. Captains have always found that this gives them plenty of income and scheduling flexibility. We”ll sometimes use part time fill-in captains, but our preference is to have two full-time captains who know the program, crew and the boat well, can commit to the season and work a 4/3 split. AQUIDNECK CREW: Ideally, crew should be available to sail from early May through the end of October. If you are able lend a hand for an extra week or two in April to help rig the boat and help in early November to down rig even better! Since we’re seasonal business and very busy at the height of the summer, crew should not require any large blocks of time-off. We usually hire four crew members for Aquidneck who work a rotating 4/3 day per week schedule. Before you panic and think that won’t be enough work, rest assured that between the day rate and tips that crew have always found that the 4/3 schedule provides enough income to be their only job for the season. SIGHTSAILER CAPTAINS & CREW: Sightsailer sails weekends only from late May until mid June, then 5 days a week from late June through Labor Day in September. After Labor Day, she sails weekends only until the end of September. She’s sailed by one captain with a Master’s license and one crew. Ideally, the captain and crew should be available from late May through Labor Day and able to sail weekends in September. We usually hire just one captain and crew for Sightsailer. STARLIGHT CAPTAINS: Starlight, our O’Day 34, is sailed by one licensed captain. She sails on weekends beginning Memorial Day, seven days a week from late June through Labor Day and then again on a limited schedule until Columbus Day. We typically hire two captains who work a rotating 4 day/ 3 day schedule. Job Descriptions and Online Applications are in the sections below. Crew, captains, and front desk applicants should complete an Online Application. Management or office positions should submit a resume in addition to the Front Desk Application. We accept applications year round. An in-person or Skype interview is required for all positions. Sometimes, due to the volume of applicants, we can’t respond to every single application. Feel free to rattle our cage if you think you’re perfect for the position and we haven’t contacted you. We’re human and sometimes things fall through the cracks! The Front Desk positions are at our waterfront, open-air pavilion on Bowen's Wharf. Because we're located in a high pedestrian traffic area and easily accessible, a good amount of business comes from people who walk by, stop and are curious about what we offer. Being able to engage in a friendly, helpful manner and confidently explain and educate folks about our different boats and sailing options is an everyday and large part of the job. Prospective customers often buy tickets for a sailing cruise or book a private charter on impulse, based on your conversation with them. You'll also respond to email inquiries, answer the phone, check-in in guests who have already purchased tickets or charters, run a cash register, balance the cash drawer, complete end of day reports, etc. We will train you and make sure you know about our sails, boats, booking processes and policies. Sometimes we'll see if you can help out with other light office or marketing tasks. *You should have excellent written and verbal communication skills, be punctual and reliable. You should be someone who can cheerfully engage with people and who enjoys explaining, and educating people about our sails. You should be organized, a quick learner, have excellent attention to detail, be a bit competitive and be capable of working both alone and with a team. Basic computer skills required. Familiarity with cash registers and closing procedures a plus. Additional skills in various social media platforms a plus. *Prior sales, retail, restaurant, hospitality, customer service, or administrative experience helpful. Our Appearance and Dress Code standards are similar to many service oriented businesses. They have been established to present the image of a friendly, professional and hospitality oriented staff. We love you for your energetic and unique personality, however no Mohawks, multicolored hair, Satanic ritual cuts, septum piercing, ear gauges, etc. You get the idea. We will give you cool company shirts, outerwear and assorted swag to wear. Hourly Wage plus commissions and bonuses. We hire crew for Aquidneck, our 80' schooner and Sightsailer our 46' sloop. These are very different boats so we look at different parts of your sailing experience, however one of the most important things that will determine whether you're hired is your availability. We look to hire crew who are available and can commit to a boat's operating season so we don't find ourselves in the unenviable position of trying to find and train someone come mid to late season. For both boats, crew need to know the basics of sailing and basic sailing terminology. Required Availability both boats: You should be flexible, a team player and be available to work weekdays, weekends and/or holidays. You should not require any long vacations or large blocks of time off. Aquidneck availability requirements: If you're applying to crew on Aquidneck, you should be available to sail our entire season, from May through the end of October. If you're around in April to help start working on the boat in the yard even better. Crew on Aquidneck usually work a rotating 4/3 day per week schedule. In rare cases, we'll make an exception and take a crew who can sail or from May through Labor Day and then 2 days a week through late October. Sightsailer availability requirements: Sightsailer's season is shorter than Aquidneck however you need to be available weekends from late May through mid to late June, then 5 days a week in July and August, and weekends only again in September. We usually only hire one crew for Sightsailer who sails 5 days per week on the above schedule. Physical Requirements: Crew positions on Aquidneck require heavy lifting and physical labor. Crewing on a big schooner like Aquidneck is very different than sailing or racing a dinghy. Tacking and gybing are the same but the the sails are big and heavy and things happen more slowly. 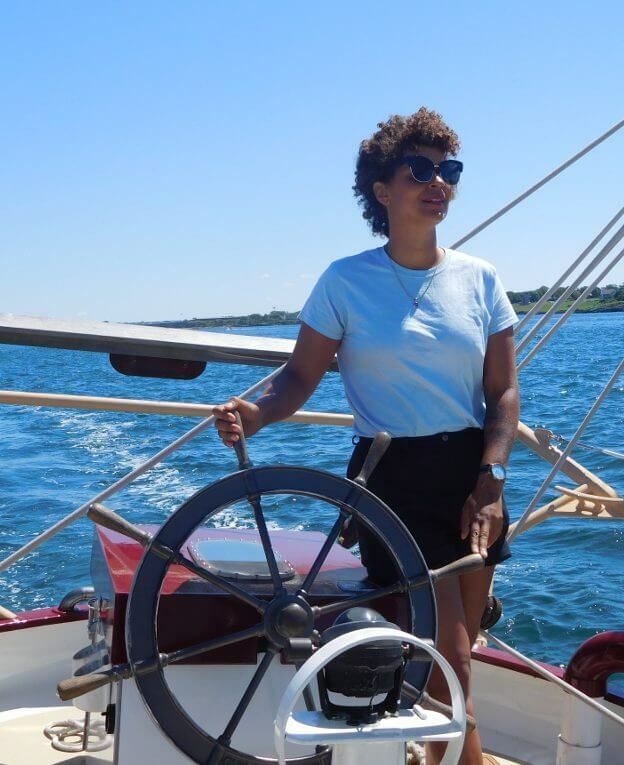 Due to her displacement and size of her sails, crewing on Aquidneck requires a certain amount of strength and stamina. You also need to be surefooted so you can scramble out on the bowsprit or bow net, have no fear of heights or stability, balance or vertigo issues. Women can do it, but need to be fairly strong and in good condition. Crewing on Sightsailer is much less physically demanding than Aquidneck (sloop vs. schooner), however you still you need a fair amount of strength and stamina. Our Appearance, Dress Code and hygiene standards are similar to many service oriented businesses. They have been established to present the image of a friendly, professional and hospitality oriented staff. Appearance: We love you for your energetic and unique personality, however no Mohawks, multicolored hair, Satanic ritual cuts, septum piercing, ear gauges, etc. Hygiene: You'll be working in close quarters with fellow employees and guests. Thus YOU and your clothes should be fresh, clean and odor free. You get the idea. Dress: We will provide you with company shirts, outerwear and assorted swag to wear. Additional info is in our Crew Handbook. *Crew must pass a Pre-Employment drug test and participate in a mandatory USCG Random Drug Testing Program. *Crew need to adhere to Appearance & Dress Code Standards. *Since we serve alcohol, you must be over 18. Crew have the largest impact on our guests' experience. We like to hire people who smile, make a nice impression, have a positive attitude, enjoy meeting others, like giving guests a nice experience and know, at a minimum, the basics of sailing. It's important to realize that we're in the hospitality AND sailing business, so your appearance, sunny disposition and positive attitude are important. Many of the people we take sailing have never sailed before. Newport has one of the prettiest harbors in the world with all sorts of interesting sights and is the sailing capital of the world. It's your job to help sail the boat, point out and talk about some of the sights and make small talk with the guests. Being able to talk with and give guests a positive experience is vital. We want them to come back next year, tell their friends or rave to the concierge at the hotel what a great time they had! While these jobs are fun, offer a great learning experience, friendships and allow you to make some good money, they are also physically demanding. You will be crewing on sailboats that offer public sails and private charters. We take out scores of people especially at the height of the season and offer 4-5 trips a day. Add up setup/breakdown time and at the peak of the season it's a good long day. You need the energy and endurance for that. For the right individuals, these jobs are a lot of fun. It can be hard work however you get paid to meet people from all over the world, show them a good time, hone your boat handling skills and sail all day in the sailing capital of the United States! If you're interested in becoming a licensed captain and would like to commit to working here we can help you with that too. * Learn about the sights we sail by and be able to speak about them casually. No fear of talking in front of large groups! Interact with guests, engage in casual conversation. * Willingness to take direction and initiative, get one's hands dirty, jump willingly into tasks and demonstrate a desire to learn. * Prepare Aquidneck or Sightsailer for sailing each day including cleaning decks, stocking coolers, reefing, organizing stowing supplies, etc. • Ensure guests safely embark and disembark vessel. • Take active role in sailing vessel including raising, trimming, flaking sails, taking helm etc. Pay attention to sail trim. Demonstrate awareness of what's happening both on boat and vessels nearby. • Load and unload food and drink for private charters. Serve drinks on sunset cruises. Stow beverages in coolers. *Put boat to bed after sailing. • Assist in performing daily, weekly and monthly safety, & maintenance tasks. • Crew are paid a flat day rate plus tips. Average daily compensation is often well over $200. Many of our crew have spent a season or two as crew and worked their way up to captain. License assistance available for qualified candidates. Captains have a large impact on our guests' experience. We like to hire captains who are friendly, well spoken, enjoy meeting others and are good sailors with solid skills. It's important to realize that we're in the hospitality business as well the sailing business, so you need to not only like to sail, but also enjoy showing guests our fantastic harbor and bay, talking with them and being a friendly host. Many of the people we take sailing have never been sailing before. It's your job to sail the boat well, answer questions and help guests have a nice experience. We want them to write us an excellent review, tell their friends or rave to the concierge at the hotel how great the captain and crew were! While these jobs are fun, they are physically demanding. We take out scores of guests and offer four to five sails a day with 20-30 minutes between sails. You need the energy and stamina for that. We currently operate 3 sailing vessels all with different schedules. Aquidneck is an 80' steel schooner designed by Charles Wittholtz, sailed by one licensed captain and two crew USCG certified for 49. Sightsailer is a very light, narrow, 46' aluminum sloop with a heap of sail area, designed by Yves Marie Tanton, sailed by one licensed captain and one crew and certified for 13 guests. Starlight is an O'Day 34 which sails by private charter only with just 2-6 guests. When applying. please indicate which boat you think you're interested in. Captains need to have excellent sailing skills as well as outstanding boat-handling skills, docking sailboats under power. Our boats are docked in a congested, high profile marina surrounded by million dollar yachts and historic wooden boats. Aquidneck is 80 foot long with a beam of 17 feet and needs to be consistently backed out of and returned to her slip unscathed as well as without wiping out the ol' wooden Hinckley or Fife at the dock next door. She has a bow thruster but still, you need confidence and experience in tight quarters. Starlight and Sightsailer are easier to handle but your boat handling skills still need to be razor sharp! Captains are responsible for performing routine daily, weekly and monthly maintenance checks. Captains must learn and adhere to arrival and departure schedules for our boats and others we share the dock with. Learn and the boat, pay attention to sail trim, tides, current and sail the boat well enough that you get it where it needs to go, so you deliver what's described, meet and manage guests' expectations. Learn the points of interest we sail past so you can help point out sights or answer guests' questions about them. You don't have to talk the entire time, but you shouldn't expect the crew to carry the entire boat to make up for your lack of knowledge. If sailing on our larger boats with crew you should enjoy getting to know them, sharing your knowledge and fostering the camraderie and mutual respect that will hopefully develop. And if sailing with crew, you are expected to share all work and work side-by-side with them whether it's loading food/drink aboard for a charter or performing maintenance or cleaning tasks. All captains must pass a Pre-Employment drug test (or show proof of having been tested within past 180 days) and be enrolled in an industry required Random Drug Testing Program. Aquidneck: USCG Master's License, Inland or Near Coastal, minimum 50 tons, with Aux Sail endorsement. FCC MROP. Sightsailer: USCG Master's License, Inland or Near Coastal, minimum 25 tons with Aux Sail endorsement. FCC MROP. The schedule for captains varies depending on which boat you are sailing but you should be available to work weekdays, one weekend day and on holidays. Captains are paid a flat day rate, plus tips when sailing. On Aquidneck & Sightsailer tips are pooled equally with crew. Tips are frequently very good. Average total compensation varies, but is well over $200/day+. For the right individuals, these jobs are a lot of fun. It can be hard work, however you get paid to sail all day in one of the prettiest, most interesting and historic harbors with some of the best sailing conditions to be found anywhere, and meet people from all over the world. There is no other place like Newport. And at the end of the day, you're off the boat. Think about that!